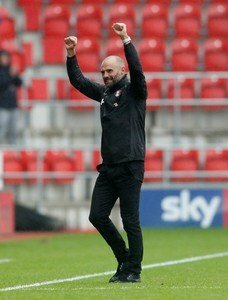 Rotherham United Manager Paul Warne has been nominated for the Championship Manager of the Month for November. An unbeaten run throughout the month has earned the Millers Boss a chance of winning the accolade along with three of his fellow Championship Managers. Warneola, as he is now known to Millers fans, reluctantly took on the role of temporary manager in November 2016 when Kenny Jackett decided the job was too much for him, before being given the job on a full time basis in April last year. Always a fans’ favourite Warney played over two hundred and sixty games for Rotherham as a forward in two separate spells. The other managers nominated are Norwich City’s Daniel Farke, (whose team beat the Millers last Saturday at Carrow Road) Darren Moore of West Bromwich Albion (who Rotherham are yet to meet) and Aston Villa’s Dean Smith (who the Millers lost to at Villa Park in September).